Flagship Fiction is pleased to introduce our newest (and youngest!) author, 16 year old Erin Burnett of Northern Ireland! Erin is the author of Liza’s Avenger, a Christian Fantasy Adventure novel written primarily for the enjoyment of 8-14 year olds but exciting and family-friendly enough to appeal to readers of all ages. Liza’s Avenger is currently available for sale in the Amazon Kindle Store at http://www.amazon.com/dp/B014WZ0864 and the paperback edition should be ready for release in time for Christmas! Flagship Fiction: First of all, congratulations on your debut novel! Liza’s Avenger is available now in the Amazon Kindle Store. Can you tell us what your story is about and what inspired you? Erin Burnett: Liza’s Avenger takes the typical fantasy plotline of avenging a loved one and gives it a Christian twist. The most important message I hope to get across is that God is in control of everything, even when circumstances seem bleak. God can forgive anyone, even though we have committed heinous sins. Another element central to the plot is sisters, hence why it’s dedicated to my sister! 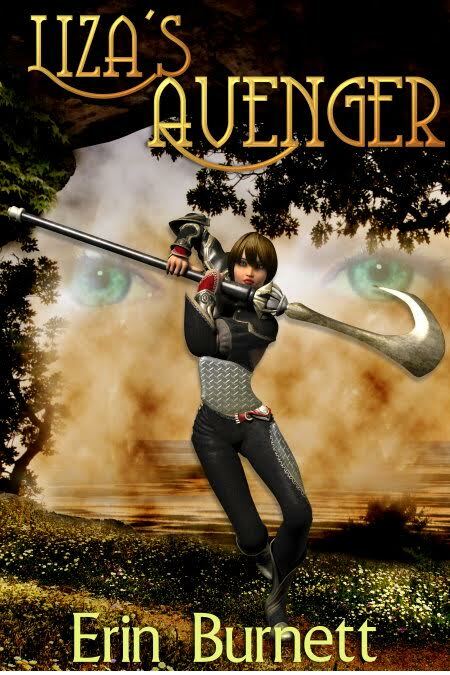 Liza’s Avenger started life as an RPG game I made way back in 2011, but I felt my limited technical ability was holding me back from conveying the story I really wanted to tell, which is why I decided to write it as a novel. It was entirely pantsed (written without planning) but I was inspired by my favourite childhood fantasy authors such as Cornelia Funke as well as the RPG games I loved playing. In fact, one of the main criticisms of the woeful first draft was it read far too much like a game script. The religious element was added to and improved with each draft. I wasn’t saved when I started writing it and this is reflected in my arbitrary understanding of Christianity; the characters only prayed in dire circumstances and the name of Christ was not even mentioned. However, when I actually read the Bible and got right with God I realised my writing could become my ministry. Flagship Fiction greatly helped with this element. Flagship Fiction: Without giving away the key plot points, tell us more about some of your main characters. What about their personalities do you think will resonate with your readers? Erin Burnett: Several of my characters share traits or names with people I know. I hope young people who read it will be able to relate with the headstrong Hikari, upbeat Kerry, steadfast Noi or super-smart Rhianna. On a spiritual level each character represents a common situation within Christendom: Hikari’s past has led her to become hostile towards God; Kerry is a Christian who struggles with sharing her faith; Rhianna is too caught up with everyday life to give God much thought and Noi simply never gave it much thought. There are others I could mention but that would spoil some of the story – you’ll have to read it and see! Flagship Fiction: As a first time author, do you have any advice for prospective authors who are struggling to write their first manuscript? Any words of wisdom or encouragement you’d like to share? Erin Burnett: The most important thing is to just write! Don’t worry if the only feedback you receive is negative, you can use it to improve your craft. Very few people are born naturally brilliant at writing. Joining a writing group can be very beneficial for sharing work and getting feedback, as well as meeting other like-minded people. And cake. A lot of writers fall into the trap of thinking everything has to be perfect in the first draft. You need to get words on the page and you can improve it later on when you start editing. NaNoWriMo is a great program for novel writing – you sign up to write 50,000 words during the month of November. The tight time limit helps discourage procrastination and you can meet with other WriMos in your area. This is how my first draft was born. However, if I was to write another novel I would make a rough plan first. The unplanned nature of Liza’s Avenger meant there were countless plot holes which needed fixed! Remember God is sovereign over everything, including your novel. Pray often and trust He will use it to His glory. Flagship Fiction: Amen to that! So what’s next from here? Should we expect future installments of Liza’s Avenger? Erin Burnett: I once started to write a sequel set ten years in the future that had Kan as the main character, attending a boarding school for would-be explorers. I got to 25k and stopped writing it because I felt it was going nowhere, but one day I would like to plan it a little better and give it another shot. I’m not ready to say my final goodbyes to these characters yet! These days most of my time is spent studying or procrastinating, but I still like to write. Currently I’m co-writing a visual novel with someone else but at the rate we’re going it will be a while before it’s released. Flagship Fiction: As a world traveler and someone who hails from Northern Ireland, do you see potential in Christian Science Fiction and Fantasy helping spread the Good News of the Gospel across the planet? And if so, how do you think the Christian Spec Fic community should go about pursuing this objective? Erin Burnett: I believe Christian fiction is a great way to reach those that would normally never consider reading religious literature. Many have the misconception that adding religion to something makes it boring, but we just have to look at the Bible to see this isn’t true. The Bible is filled with dramatic tales of kings, battles, journeys and romance. Christian fiction will never replace Bible reading but it can be a great supplement. CS Lewis (who also came from Northern Ireland) is probably the most famous Christian fantasy writer – his books are still being read worldwide! There is great potential in this genre, and social media allows us to reach people from all over the planet. Christian fiction can be difficult to get right. On one hand, we want it to clearly and effectively communicate the gospel but on the other we don’t want it to become so preachy that unbelievers are turned off. It’s the same with all forms of Christian art. The community should strive to encourage Christians the world over to use their gifts and consider spreading the word through their writing. Groups like Flagship Fiction are vital to this cause.